Cricket has become the latest sport to link up with the National Institute for Health Research Surgical Reconstruction and Microbiology Research Centre’s (NIHR SRMRC) expertise. SRMRC director Professor Tony Belli led a team from the Birmingham-based research centre which travelled to Loughborough to deliver a presentation to the chief medical officers of some of the sport’s leading county teams. The event was organised by the England and Wales Cricket Board (ECB) and held at the new national Centre for Sports and Exercise Medicine at Loughborough University. 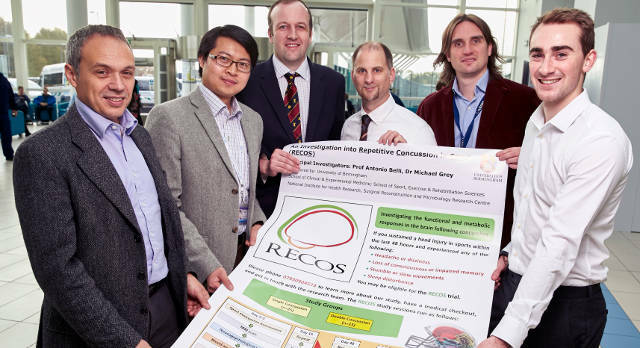 The county doctors were eager to learn about the diagnosis and treatment of concussion from the SRMRC team, whose knowledge in the field is nationally recognised thanks to their work in the ongoing Repetitive Concussion in Sport (RECOS) study. Dr Douglas Hammond, an SRMRC expert and club doctor at Moseley Rugby Club, kicked-off proceedings by outlining his guidelines for the diagnosis of potential concussion injuries on the field of play and the necessary follow-up treatment and care, highlighting the importance of a carefully managed return to training and competitive action. Professor Belli followed-up with a detailed analysis of the potential long-term effects of concussion injuries, especially multiple incidents, before Mr David Davies and Dr Zhangjie Su outlined the RECOS study and some of its findings so far. Dr Hammond said: “The presentations were very well received and the ECB are taking up our ideas about concussion protocols and using them. Professor Belli added: “It’s often a very difficult job recognising concussion on the pitch and I very much believe that each sport has got different questions to ask. Head injuries have been an area of concern in cricketing circles since the tragic death of Australia batsman Phil Hughes in a Sydney hospital last November two days after being struck on the neck by a ball.